But you didn’t see it all. Like every awards show, the Grammys keeps a few secrets known only to those who are in the room — in this case, the cavernous Staples Center in downtown Los Angeles. And while Staples is such an enormous and problematic venue that you probably did see more from home, here are a few things you might have missed. 4:30 p.m. PT — As is typical for an awards show, bars are open inside the Staples Center. But so are the usual concession stands in the arena, which more typically hosts basketball games and concerts. 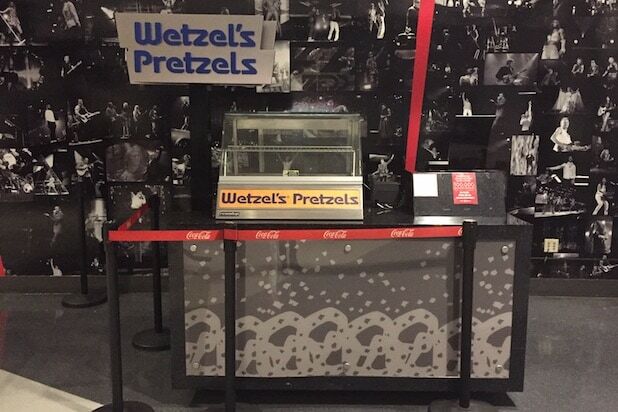 That might make this the only black-tie awards show with a Wetzel’s Pretzel stand in the lobby. 5:00 — Camila Cabello opens the show with a number that’s so extravagant, on a set that encompasses so much of the huge Staples Center stage, that she gets a couple of verses deep into “Havana” before much of the live audience can figure out where she is on the stage. It doesn’t help that the video screens on either side of the stage are relatively small, and tend to show wide shots. 5:10 — Alicia Keys brings out a quartet of friends: Lady Gaga, Jada Pinkett-Smith, Jennifer Lopez and Michele Obama. As soon as the former First Lady begins to speak, the crowd erupts in applause — not because they’ve been waiting for her to speak, but because from a distance they couldn’t tell who she was until she begins talking and gets a closeup on the screens. 5:20 — Kendrick Lamar rips through a fiery number on the Staples Center stage. But no, Lamar hasn’t reconsidered his decision not to show up or perform on the show. 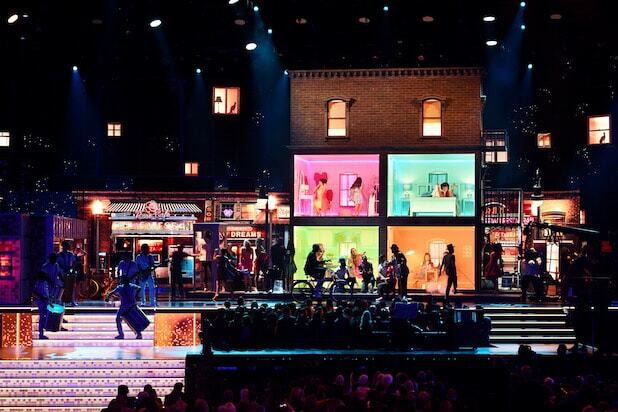 Instead, the Grammys are using the commercial breaks to show performances from past shows on the screens, starting with Lamar’s performance of “Alright” from the 2016 Grammys. 5:25 — Nina Dobrev, star of the new CBS series “Fam,” comes to the stage to near total indifference from the crowd. But the stage contains two pits full of extras who were brought in to enthusiastically applaud for everybody — and they’re closest to Dobrev and closest to the cameras, so for all viewers know she’s being greeted warmly. 5:30 — In the middle of Kacey Musgraves’ gentle performance of “Rainbow” on one side of the stage, dancers for Janelle Monae’s upcoming performance mount a riser on the other side of the stage and begin stretching. 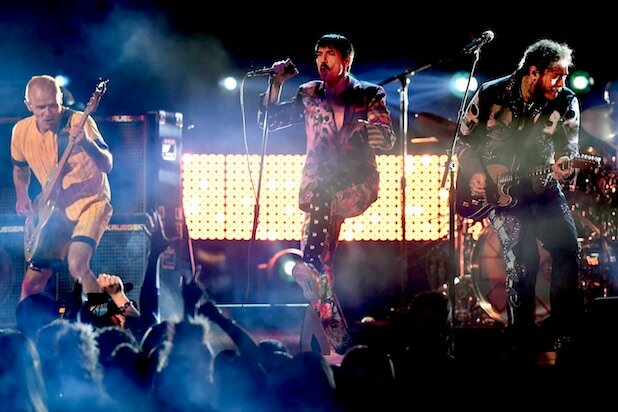 5:48 — Post Malone and the Red Hot Chili Peppers perform on one side of the Staples stage. At least it sounds like them, so the audience takes it on faith that they’re up there. 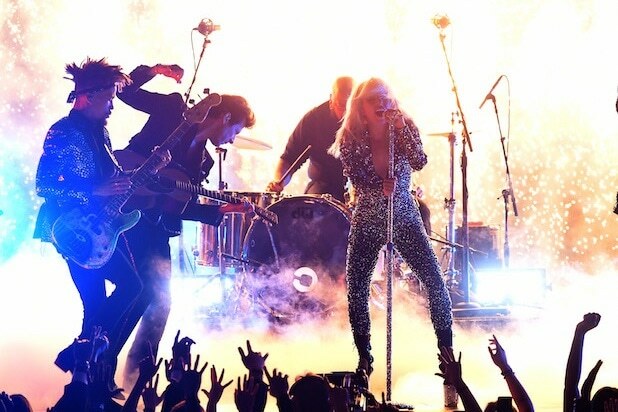 In truth, the Grammys’ preferred method of stage lighting — harsh and dramatic back lights on the performers- – essentially blinds much of the live audience and makes it impossible to actually see who’s on stage. In other words, it’s slowly dawning on the 15,000 of us who aren’t among the stars in the first 20 or so rows that we are mere props, and it doesn’t really matter how well we can see or hear. 5:59 — Dolly Parton joins Kacey Musgraves and Katy Perry on stage as part of a tribute to, well, Dolly Parton. She gets the first (partial) standing ovation of the night. 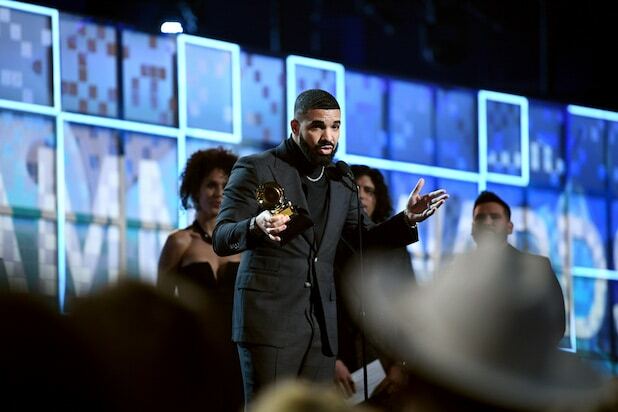 6:55 — Drake wins the Grammy for Best Rap Song and the show cuts off his acceptance speech immediately after he points out that awards aren’t all that important. Afterward, the show producers approach Drake backstage and say they thought he had finished his speech. They offer to let him return to the stage and complete the speech. According to a spokesperson for the Recording Academy, Drake declined. 7:07 — During the commercial break after her performance, Diana Ross slowly makes her way off the small satellite stage in the middle of the arena, up the center aisle, onto the main stage and down a set of stairs at the back of the stage. At every stage of her journey, she gets a big round of applause from those she passes. 7:09 — As Ross leaves, a bleacher full of fans with a view of the backstage area erupts in screams as they watch her go. 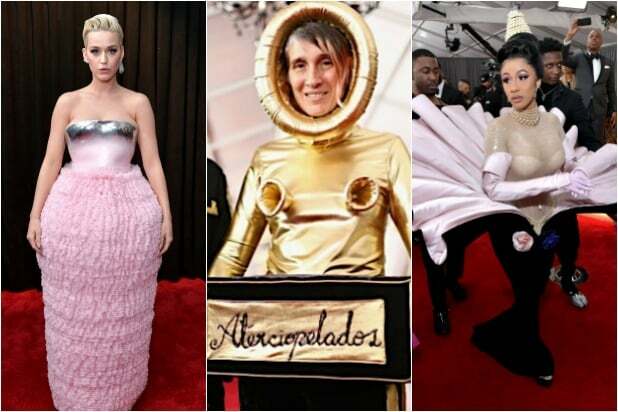 A minute later, they erupt in another round of screams as they see Lady Gaga walk toward the stage. 7:11 — Once again, harsh backlighting makes Lady Gaga almost invisible to much of the audience as she sings an arty, power-ballad version of “Shallow.” “C’mon, sing it!” she urges the crowd when she gets to the chorus. Almost no one does. 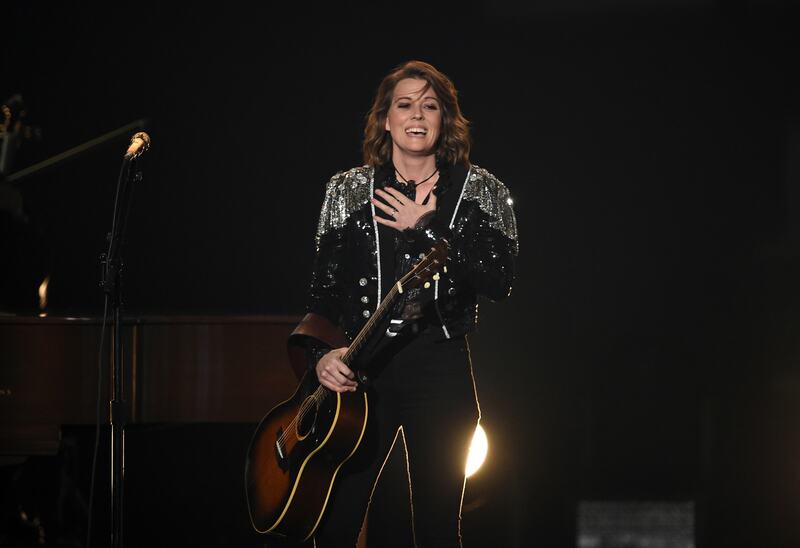 7:54 — Brandi Carlile sings “The Joke,” fighting a bad case of nerves until she looks out in the audience and spots Janelle Monae standing up with what Carlile says is “total peace” on her face. “I lost all my nervousness and just sang it to her,” Carlile says in the press room afterward. By the end of the song, guests throughout the lower sections of Staples Center have jumped to their feet in the closest thing to a full standing ovation on the show. 8:10 — During the commercial break moments after Cardi B becomes the first woman to win the Grammy for Best Rap Album, a woman collapses on the stage. Show staffers surround her and slowly get her to her feet and off the stairs before the show begins again. 8:40 — The show shifts from wall-to-wall performances to back-to-back awards, as Childish Gambino’s “This Is America” wins Record of the Year and then Kacey Musgraves’ “Golden Hour” wins Album of the Year. With the show well past the three-and-a-half hour mark (and that doesn’t even count the hours of pre-show awards handed out across the street at the Microsoft Theatre), large chunks of the audience head for the exit as soon as Musgraves’ name is announced, and well before she gets to the stage.